Flourless Gluten Free Chocolate Chocolate Cake. So tasty, you won’t even realize it is gluten free. Simple and easy. Hi. It’s Lois at Recipe Idea Shop, where I made this delicious Flourless Gluten Free Chocolate Chocolate Cake recently. It’s a cake that our daughter Roni asks for regularly. The frosting is especially good. 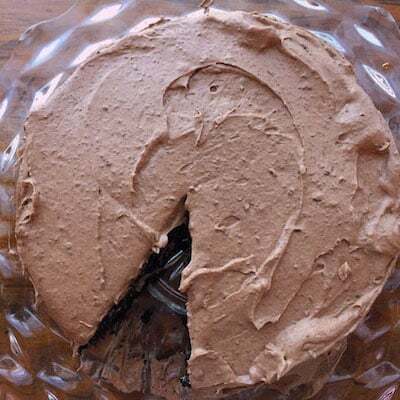 The original recipe came from Mel’s Kitchen Cafe, where it’s called “Decadent Chocolate Cake with Whipped Chocolate Frosting.” A friend of mine recommended it to me, and I’ve made it multiple times. It has an unusual ingredient. Can you guess? This Quinoa Chocolate Cake (Flourless GF Chocolate Chocolate Cake) is amazing. The cake is a little chewy because instead of flour you use cooked quinoa. I don’t eat dairy except for butter and the milk that is in semi-sweet chocolate chips, and I much prefer dark chocolate to milk chocolate or semi-sweet chips. I included the butter the recipe calls for, but I substituted coconut milk for the milk in the original recipe. 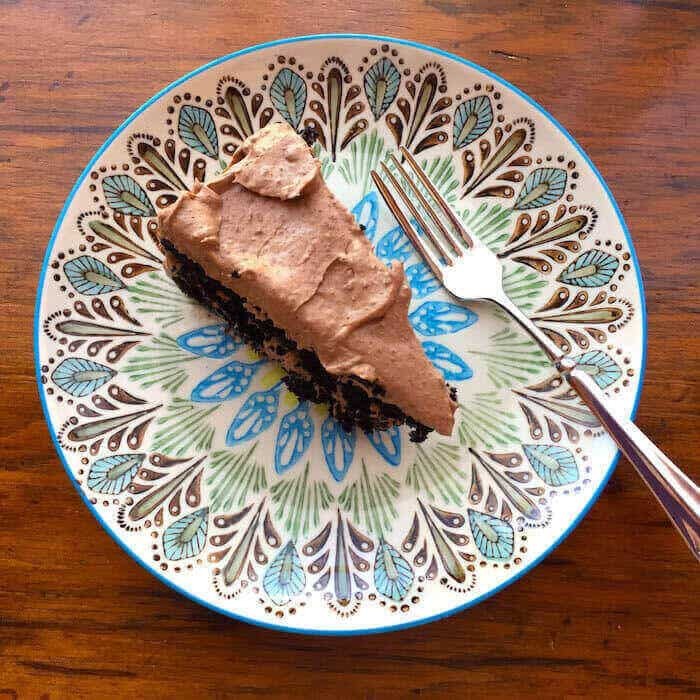 This is a super good flourless gluten free chocolate chocolate cake, and the quinoa gives it an interesting texture, which I enjoy. The cake is moist and packed with flavor. 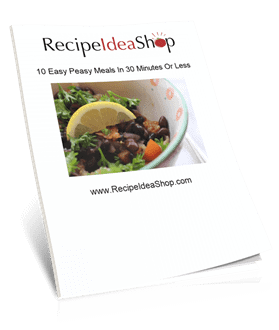 I will keep working on the recipe, however, because I don’t like the occasional hard piece of quinoa. Next time, I plan to soak the quinoa for an hour before cooking it. Maybe that will make a difference. And the good thing is, I’ll get to eat more cake. 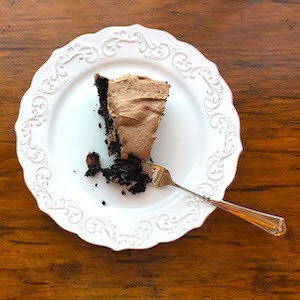 You’re gonna wanna eat this Flourless Gluten Free Chocolate Chocolate Cake (which I think of as my Quinoa Chocolate Cake). I do! However, if you prefer a standard Chocolate Cake, try My Favorite Chocolate Cake recipe. It’s my all-time favorite. 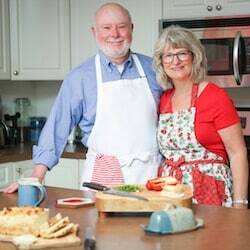 For this recipe, I use measuring cups and spoons, a covered saucepan, medium bowl, and my Kitchenaid stand mixer (you can use a hand-held mixer if you don’t have a stand mixer). This is a three-part recipe. You can make it all in one day, but I prefer to make the quinoa and frosting one day and the cake the next because both have to be cooled before putting them in or on the cake. Nothing takes very long to do, but the refigeration and cooling take time. Put the water and quinoa In a small, covered saucepan and heat over high heat to boiling. As soon as it boils, cover the pot and turn the temperature to low. Simmer for about 12-15 minutes until all the water is absorbed and the quinoa has a ring around the center and is fluffy. Set aside to cool. I refrigerate it and make the cake the next day. Make the frosting next because you have to cool it in the refrigerator fully (for a few hours) before beating it. I simply pour the chocolate chips and coconut milk (or cream if you are using it) into a medium glass bowl and microwave it for about 2 minutes. Stir to combine and even out the heat. The chips will continue to melt as you stir since microwaves do not heat evenly. If the chips are not fully melted, heat again, 30 seconds at a time until fully melted. Stir. Chill in the refrigerator for several hours or over night until cold. Whip with an electric mixer until fluffy. Put 1/3 cup coconut milk, the eggs, vanilla, butter, and sugar in a mixing bowl (I use my stand mixer) and beat until smooth. In a separate bowl, mix the cocoa powder, baking powder, baking soda, and salt. When combined, dump these dry ingredients into the wet cake ingredients and mix to combine. Add the cooled quinoa to the batter and mix to combine. Spray two round cake pans (I use 8 or 9 inch pans) with baking spray. Some people add parchment paper (cut to fit the bottom) on the bottom of the pan to prevent sticking (or you can use wax paper), but I have good, heavy pans that don't stick, so I don't bother with that. Divide the batter between the two pans and bake in the oven for 28-30 minutes, until a toothpick inserted comes out clean. Take the cakes from the oven. Let them cool for about 5 minutes before removing them from the pans. Use a table knife to loosen around the cake pan to make sure the cake doesn't stick when you are trying to remove them from the pan. Invert the cakes onto a cooling rack, removing them from the cake pans. If you used parchment or wax paper, peel it off now or it won't come off nicely. Let the cakes cool before frosting them. Spread the whipped frosting over the top of one cake, place the other cake on top, and continue to frost the top and sides of the two-layer cake. 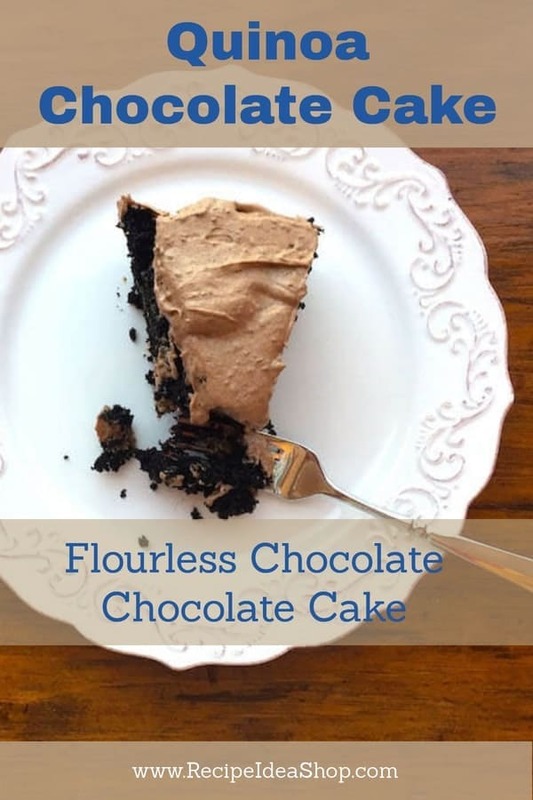 Flourless Gluten Free Chocolate Chocolate Cake Nutrition Label. Each serving is 1/12 the cake, or about a 2″ piece of frosted cake.